Human behaviour such as speech and movement requires precise coordination in time. But how does the brain perceive time? In particular, how does the brain perceive the durations between the intervals in a sequence of sounds, such as rhythms we hear in music? A study published online today in the Journal of Neuroscience, by researchers at the Wellcome Trust Centre for Neuroimaging, University College London (UCL) and Newcastle University, shows that the brain uses distinct timing mechanisms to measure the duration between the intervals in a sequence of sounds and found that distinct parts of the brain are involved in the these timing mechanisms. The team comprising of Sundeep Teki, Dr. Manon Grube, Dr. Sukhbinder Kumar and Wellcome Trust Senior Research Fellow, Professor Timothy Griffiths presented sequences of click sounds to eighteen volunteers in a magnetic resonance imaging (MRI) scanner. Participants were required to judge if the duration of the last interval was shorter or longer than the penultimate interval. 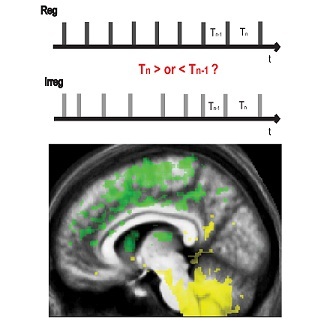 By varying the regularity of the preceding intervals (from very irregular to regular, containing an isochronous beat like the second hand of a clock), the researchers were able to show that the brain uses different mechanisms and areas for the timing of regular and irregular sequences of sounds respectively. A network in the basal ganglia was activated for the timing of regular sounds, while a cerebellar network was found to activate for the timing of irregular sound sequences. "The basal ganglia and cerebellum are primarily motor structures and are known to be involved in time perception, but we have shown for the first time that their role in time perception varies according to the rhythmic context of time intervals," explains Sundeep Teki, a PhD student at UCL. "We found that the cerebellar network measures the absolute duration of individual time intervals, like a stopwatch while the basal ganglia network is involved in the measurement of time relative to a regular beat or rhythm in the sounds, for instance, timing relative to a metronome." "Patients with movement disorders such as Parkinson's disease due to impairment of the basal ganglia network or ataxias due to cerebellar pathology show cognitive deficits in time perception. These results suggest that their timing deficits can be distinguished on the basis of rhythm," explains Professor Griffiths. This research was funded by the Wellcome Trust, UK. Image: Regular and irregular sequences of sounds and corresponding brain activations. A network consisting of the prefrontal cortex, pre-motor cortex, thalamus and the basal ganglia is involved in relative timing of regular sounds (green) while a network comprising the inferior olive and the cerebellum is involved in absolute timing of irregular sounds (yellow).